I’ve been casting around for a recipe suitable for a “first post.” Should I start with a something outrageously kitschy? Resurrect a glorious culinary gem? I eventually thought: what’s more vintage than my grandma’s recipe box? If I’m going to be exploring culinary history, I might as well start by exploring my own. 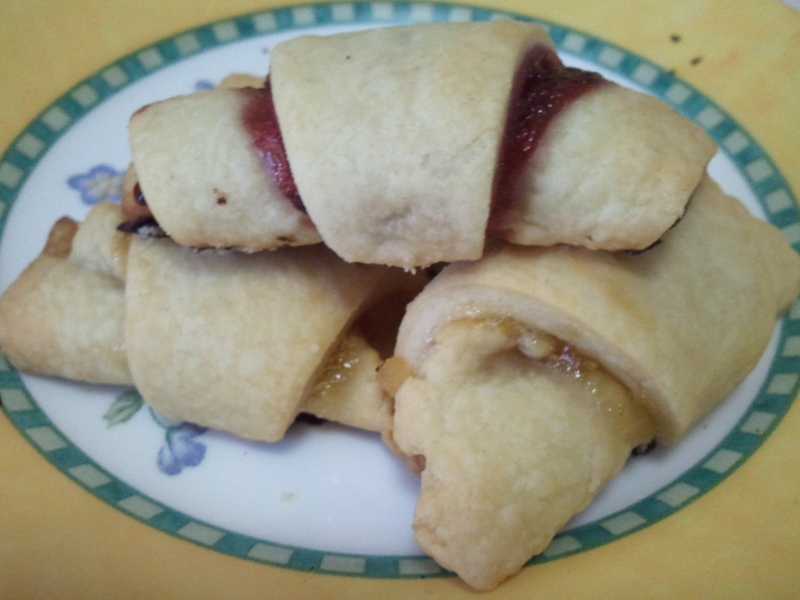 So, my first post is a tribute to my Grandma Viv: Rugelach. This tribute is not as literal as it could be. I mostly remember my father’s mother making rugelach very simply, from leftover pie dough and cinnamon sugar. With her in mind, though, I’ve cobbled together the following: Joy of Cooking dough (pretty vintage itself), one recipe with a more traditional filling (raspberry jam, cinnamon sugar, shaved chocolate) and one with an original filling (peach jam and candied ginger – I call this “original” but my dad and grandpa would probably condemn it as “goyische”). 1. Mix the cream cheese and butter until fluffy and well combined (about 20-30 seconds on medium-high in a stand mixer). 2. Add all the flour at once and mix on slow until it forms a solid mass with the butter and cheese. Turn this mass out onto a floured surface and knead it about half a dozen times, until there are no large chunks of butter or cream cheese visible in the dough. 3. Separate the dough into 3 parts and pat these sections into discs about 1 inch thick. Cover the discs in plastic wrap and refrigerate for at least an hour. 5. Remove one disc of dough from the fridge and roll it out on a floured surface to 1/8-inch thick circle. Cut the circle into 8 or 10 pie-shaped wedges, keeping these wedges together in their original circle. 6. Spread about 1/4 c. of the jam of your choice on the round of dough, avoiding the center and leaving a band of clean dough about an inch wide at the outer edge. Sprinkle about 1 tbsp. cinnamon sugar over the jam and then 1 tbsp. of chocolate shavings (if using raspberry jam) or 3 tbsp. chopped ginger (if using peach). 7. Starting from the outer edge, roll each slice in toward the center point. Place the resulting roll point-down on a cookie sheet covered in parchment. 8. Repeat for the second and third discs of dough. 9. Bake 20-25 minutes until the cookies are golden brown on top. I always make pinwheel cookies form left over pie dough. Your recipe sounds delicious! those rugelachs were da bomb, and now i also know how to say rugelach. I love rugelach! I’ll have to make Powder try this recipe out.